I thought I would take a trip down memory lane, back to my first car. You see, due to recent car troubles, I have been reviewing my car decisions. They have all been bad. My first car was a beauty. It was similar to the photo. I don’t have any photos of mine though. It was a 1988 Mazda 323, turquoise. It was $1,100. All I had. I had the choice between buying it that day or waiting (like dad wanted me to) a few days til we could look at the Corolla. Nope. 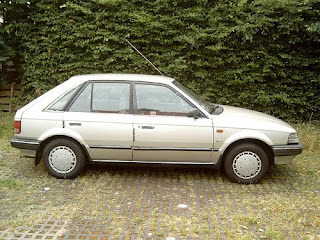 The Corolla was white and ugly in my young mind. My older mind now says IDIOT! You should have bought the Corolla!! The thing that really won me over with the Mazda was the colour. I know, everyone else is probably gagging at the thought of a turquoise bomb! Why did I love the colour? It matched my hand bag. Yes, I was a blonde 18 year old Gen Y, who purchased a car because it matched my hand bag. So I moved to Sydney in that car. I had it for 3 months and it died. I was driving "home" (to my parents house in Canberra) for my brothers baptism. Just outside of Goulburn it started making a funny noise. So I pulled over at the first exit and did what every young female driver would do in my situation. Rang dad. “Hi dad, so why would my car be making this noise?” I hold the phone next to my engine. So I drive it, or more correctly hobbled it barely at 5kms an hour to a service station. I call NRMA. Before they get there 2 more cars break down beside me. Yay, I am not a loner. NRMA come and fix one, he’s gone. They look at mine. It’s dead. They’ll arrange to tow it back to my mechanics in Sydney. Great. I ring dad, him and mum are already on their way to get me. I am just over an hour from their house. I decide to wait in the servo. The other guy who has broken down next to me doesn’t look like someone I want to hang around. I go inside. Ok, the attendant is freakier than the guy outside. I will take my chances sitting in my car with him in his car. I go back to my car. Great, I am so intelligent that I locked my keys in my car. It’s ok though, my car lock is so awesome you can open it with any key, even a knife! Do I ask the guy near me or ask the weirdo in the servo. I ask the guy near me. As it turns out, that guy is really nice and we get talking. He was on his way to see his daughter in Melbourne. She was in the Navy and he had not seen her in 6 months, but she had this weekend off before being deployed to Iraq. He only needed one tiny tube part to get his car started. I offered for him to see if a part from my car would fit his. His response “I already checked when you were inside. It doesn’t, but thanks.” Awesome, I am sitting with a thief. His next comment “Want a joint?” Uh, no, no thanks. And yes, he was still not weirder than the guy inside the servo! So I hung out with him for an hour until my parents got there. He had food and drink and drugs. I had none of it, but he was entertaining. My parents love it when I say “I have a question”. I still do it now. It is my way of saying I am about to ask for something and I am not sure you will want to do it. Oh my gosh! they hate when I say that too! "Mum... I have a question..." her response "Of course you do!" I'm the sister who can buy good cars LOL And Lambchop you made a good desicion about buying a Mazda you just didn't treat her right hehe.